I don't mess around when I make yogurt. I make a four gallon batch. Yogurt made from raw milk will keep up to four weeks in the refrigerator and it's much easier for me to make a large batch once a month than to make smaller batches more frequently. First let's talk about raw milk yogurt. Technically, if you want your milk to be the "perfect medium" for the thermophilic yogurt culture to remain true, then you would want to first pasteurize your milk. Most recipes require one to take their milk up to 180 degrees Fahrenheit and then allow it to cool back to 110 to 115 degrees before adding culture. However, I choose not to pasteurize my raw milk when I make yogurt. This means that as the yogurt incubates in unpasteurized milk, there is a possibility of mesophilic culture competing with the thermophilic culture. (Mesophilic culture is what happens naturally when one allows raw milk to clabber. More about clabber here.) What I have found is that the raw milk yogurt tastes great when handled correctly and there is no reason for those of us who see benefits in drinking raw milk to have to pasteurize our milk in order to make great tasting yogurt. *Four gallons of raw (unpasteurized) milk. The milk can be skimmed of the cream or whole. *1 quart of yogurt starter. You can buy any brand of yogurt of your choosing to use as starter as long as it contains active cultures (Live cultures will be identified on the side of the carton). Once you have made your first batch, you can save back some of your homemade yogurt to begin your next batch. One can also buy powdered yogurt starter from a cheese making supply company and use it according to their instructions. 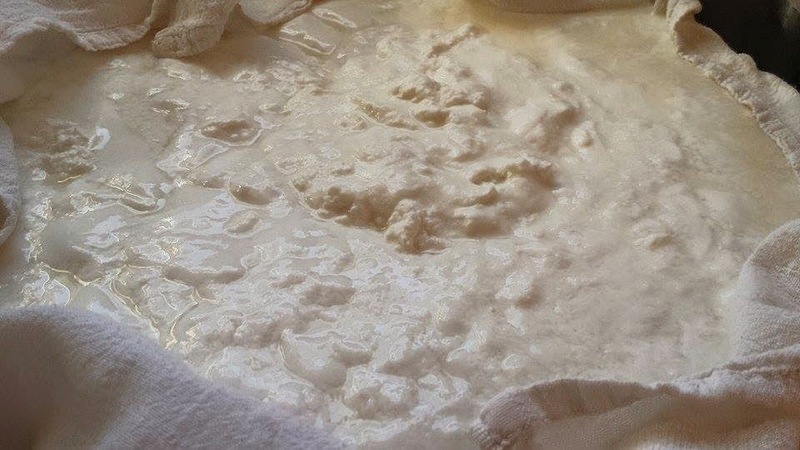 *Note: If you are making raw milk yogurt and using yogurt from a previous batch to culture the next batch and your yogurt begins to taste off after a period of time, mesophilic culture may be overtaking your batch. If this happens, simply start again as you did in the beginning with store bought yogurt for culture, or by using powdered culture from a cheese maker's supply company. This is only necessary if you are not pasteurizing your milk first before making your yogurt.